One of the first photographs in Robert Dawson’s travelogue of American public libraries features the Central Library in Milwaukee, a striking building in the Renaissance style lit elegantly in the evening. On the opposite page is an image of the shuttered Mark Twain Branch Library in Detroit, which would later be demolished in 2011. There are few things sadder than an abandoned, boarded-up library, and fewer still when placed in stark contrast to the splendor of Milwaukee’s proud marvel. That the library is named after one of America’s literary treasures makes the picture somehow even more sad. 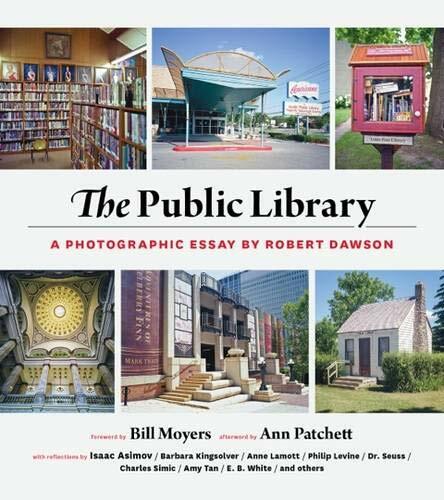 It is a deft and heartbreaking juxtaposition, one Mr. Dawson employs frequently as he makes a subtle but unmistakable argument—what he calls a photographic essay—about the civic necessity of the public library in our communities. Over the course of 18 years, Mr. Dawson crisscrossed the country photographing our public libraries, inspired by government-sponsored survey projects of the past, including the Farm Security Administration’s documentation of the Great Depression by some of the most notable photographers of the era. The images are supplemented by essays by renowned authors and knowledgeable professionals, many of them previously published. Charles Simic and Barbara Kingsolver offer fond memories of the important role libraries played in their youths. Letters written to children from Dr. Seuss, Isaac Asimov, and E. B. White are reproduced; current librarians from around the country offer their perspectives. The most memorable essay is provided by Dorothy Lazard of the Oakland Public Library. She recalls as a 10 year old helping her grandmother in a care home for adults with psychological problems, not knowing that she would use many of these same skills (patience, compassion, stamina) as a librarian, practicing “seva”, the Sikh notion of selfless service. As you make your way through these stirring images, a story begins to emerge about modern American history. You see the dedication of our movement to further public education in the early 20th century through the philanthropy of the Carnegie libraries, resulting in the monumental buildings that still stand today. In another memorable photo arrangement, the nation’s self-proclaimed smallest library in Hartland Four Corners, Vermont, occupies page-space with the recently built Central Library in Seattle, a dazzling piece of modern architecture. The collection of the Vermont library, which has since closed, “had just been sold to a local used-book dealer for $125;” Seattle’s main library cost $165 million to build. The main librarian in Tuscarora, Nevada, also serves as the town’s postmaster. The Yarborough Branch Library in Austin, Texas, has been converted from a former Americana Theater, with the kitschy front sign intact. The Mockingbird Branch Library in Abilene, Texas, is in a strip mall next to Super Bingo and Family Dollar. Over and over again, these photographs upend our expectations of what a public library is and can be. In a section of the book entitled “Evolving Libraries,” Mr. Dawson shows the librarians and citizens creatively redefining the modern library. The Berkeley Public Library in California put together a lending library of more than 2,500 hardware tools; in nearby Richmond, residents can check out seeds, use them to plant vegetables and flowers, and then return the seeds of the resulting plants the following season. In Hudson, Wisconsin, a resident named Todd Boi created a library box that he mounted on his front lawn, calling it “the First Little Free Library” under a take-one, leave-one system. The Public Library is a beautiful book intended for prominent display, but it is also a work of public service: at the risk of proselytizing, libraries are the most truly democratic, efficiently run public entities we have, and they’re uniquely qualified to tailor their services to their own communities’ needs and honor their histories. Mr. Dawson’s loving tribute reminds us all that we should be proud of our public libraries.